Good morning…today will be the last day of the searing late summer heat that we’ve endured around these parts. It will be the 4th straight day with highs in the 90s…and 5th out of 6 days with highs 90° or above. Yesterday we missed tying a record by 1° and today’s record of 95° will probably live another year although we will be very close to tying that record too. I’m NOT expecting the clouds that have been around the region for the last few days during the late morning hours into the early afternoon. My guess is without those clouds we would’ve hit 95° yesterday (at least). Today the big difference will be the stronger winds…30-40 MPH gusts are likely this afternoon. Tonight: Dry through the evening with increasing rain storm risks after 10PM…and especially in the wee hours of Friday morning. Unless these storms to the NW hold together better and don’t weaken…it may be tough to get really good rains locally. The best rains will be NW of KC it appears and we’ll deal with a weakening and breaking up area of rain coming towards KC after 12AM. Lows drop to near 60° towards daybreak. Friday: Some daybreak rain possible but we should be drying out fast during AMrush hour. Then variable clouds and MUCH cooler with highs 65-70°! This weekend: Looks good overall with highs in the 70s and more pleasant weather. Our long hot summer comes to an end in a couple of more days…officially fall starts on Saturday night before 9PM. The weather will react accordingly…and almost on cue except fall will arrive, from a temperature standpoint 1 day early. Today will be the last 90° day it looks like. You can still get a 90° day in October but you need strong SW winds ahead of a cold front and the later into the month you go the less likely we can get that high. Here is a look at the last 35 years of 1st 90° days of the year and last 90° days of the year. Looking back, you can see that it’s typical for the last 90° day to be in the middle part of September. The average 1st day is around 5/17 and the average last day is around 9/15. So today, being 9/20 isn’t really that much of a stretch in my opinion. As mentioned the rain situation isn’t that great. IF something holds together longer that can change…hope it does because it’s pretty dry out there since we haven’t had anything of significance around these parts in a couple of weeks it seems. Here is the early morning weather map…showing the front towards the NW of the KC region. Note the 40s (temperatures in RED) in the map below across a wide expanse of the the northern Plains region. Hello fall! 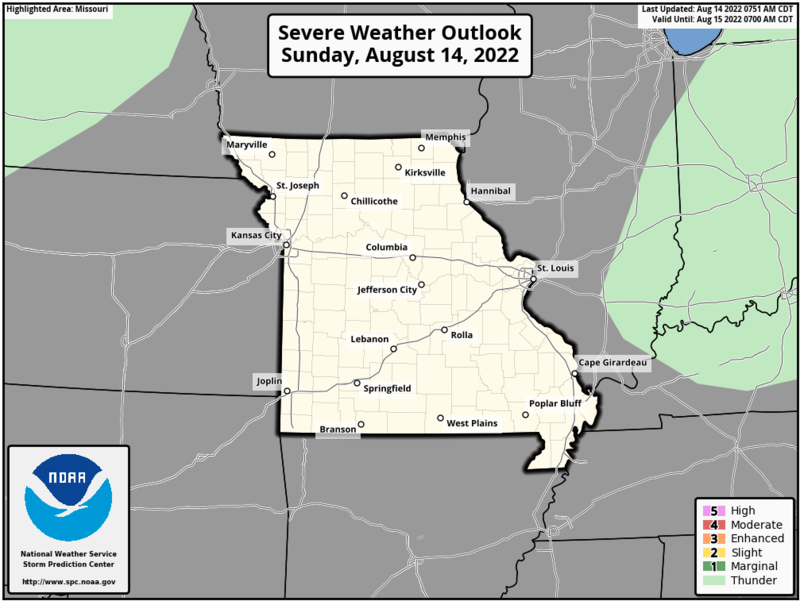 As the front sags to the SE (very slowly) it will generate a large are of rain and storms…maybe some severe weather too towards the NW of KC. Strong winds are the main threat. The higher risk and the more likely area for more concentrated severe storms is up towards northern IA and the upper Midwest. So lets add in the latest HRRR model showing an idea of future radar. This model will auto-update as the day moves along. Start looking back on this later today and tonight for additional rains. Cooler air flows in tomorrow AM into Saturday morning…a nice taste of fall coming and the weekend looks good locally although there may be rain down towards the south of the area and into southern MO. This cool air will moderate later this weekend and we’ll briefly warm up on Monday…then another stronger cold front will move through the region on Tuesday morning. That will snap the temperatures backwards and send them below average for the middle of next week. Tuesday, as we make that transition, may not be nice…hopefully some more decent rains in the region. Then additional fronts will come down…and the trends are for below to well below normal temperatures to continue through early October as well. So fall will be starting rather cool in the region. As we head towards late September and October the risks of frost start to increase again. While I think the KC Metro will remain frost free to start October the same MAY NOT be said for far northern MO and areas towards the NE of KC. Obviously clouds and wind direction come into play but if you’re a gardener…it might be worth paying attention too in about a week or so. Our feature photo comes from Tedd Scofield. That’s it for today…have a great last few days of summer.